As far as weight loss goes. I really need to find my scale and see where I am at. Last week I managed to bring my lunch so that helped to not get fast food. This week I am working on more water and healthier choices. It helps that sweet corn is coming in season because I will eat that 4 days a week. It’s the one bonus of living in Iowa. How is everyone doing on their healthy journey? Well I must start my day but here is a great recipe to enjoy! That looks really good. 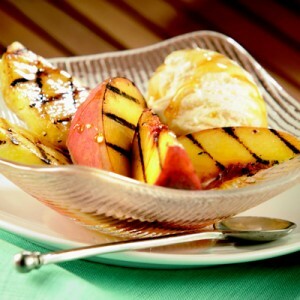 I love grilled fruit, surprisingly I haven’t made it into a sundae. Yum, I’ll bookmark your yummy recipe! Best of luck this week – one step at a time is the best way! 🙂 Two thumbs up! Awesome recipe; I’m going to bookmark it so I can try it soon!!! 🙂 You can do this – one step at a time! Hope you have a great week! What . . . no picture of the haircut?